The 2nd of November marked the first testing meet up I’d ever attended. I’d heard about this London Testing Gathering before but with my home being in Scotland I didn’t think I’d ever get the chance to attend one. That is until Stephen Hill dropped me an email asking if I’d come along to one, which just happened to be on the same night of a course that I was attending in London. Well I’m glad I did! It was a fantastic night, talking the good old testing talk with my fellow testers! So here’s a roundup of my night there, what I’d learned & what you can learn from attending something like this. 1. There was a tube strike in London that night. Despite this around fifty people turned up to the gathering! Pretty impressive & a real testament to the excellent work Tony Bruce does in organizing these. So the first person I got to meet was Stephen Hill. We talked a bit about him trying out Session Based Testing along with my desire to try this out at my company. He went on to tell me about his “do not disturb!” sign he uses when he’s in one of his test sessions It’s a good tactic, though I’m not sure if I’d try it out myself, I quite like the openness of my office & being able to go up and chat with anyone at anytime. He did say though that he sends out an email to everyone saying that he can be interrupted if it’s important, which is fair enough. He doesn’t look much older than me but he’s been a test manager for six years already! Pretty impressive! Currently he’s going solo as the only dedicated tester in his company, which is a mean feat to manage, test & report all at once. After about half an hour of chatting he began picking up some of my Scottish slang, which I found quite funny. He’s got Scots in his family so I can see how this happens, his grandmothers side I think. I got to meet a bunch of other people, many that I’d only had brief chats with. One of those being Mohinder Khosla a consultant I’d been talking with on Twitter. A man of many talents! He test’s, developers, consults & I believe was also one of the original organizers of these events, though I might be wrong on that part. Pretty impressive & it was nice to put a face to someone who prior to this was just an online profile that I knew. The star of the night was of course Michael Bolton, who had promised to come along after his Rapid Software Testing course and do a presentation to everyone titled “Burning Issues of the day!”. It was a great talk from Michael; funny, witty, outrageous, controversial, insightful, crazy? This man really knows how to hold an audience. His pace of delivery, choice of words, expressions & emotions were first class. The talk was sharp, fast delivered and exciting. I’ve got to say I really was impressed by it. You know that big multi part blog post? Michael came over and chatted a bit about Black Swans to the group that I was chatting with. I felt terribly guilty at this point, having not read his recent posts on Estimations & Black Swans. He was very excited about them & going by the buzz on twitter around this I’ll really have to set aside some time to read them soon, although I want to do it in one sitting as to retain as much information as possible. Michael’s a very excitable guy! Really! He’s quick to obtain people’s attention with his eccentric ness. He’s also never short of an interesting story & is a very strong promoter of our craft, encouraging others to follow in his footsteps and promote better testing! Mike Scott, another tester on the Rapid Software Testing course with me, was another interesting chap. He’s a very vocal guy, who loves to talk about testing. He talked about his job as a consultant & how sometimes he has to give his clients a bit of shock therapy to get them to realize their problems. We talked a lot about the need for good communications between developers & testers. We also talked about testers working with off shore teams, how this can be difficult & how to overcome those problems. Above is the only picture I managed to take all night. I should have took a few more, I’ll remember next time. From left to right in this pic: Mike Scott, Del Dewar, Tony Bruce & Peter Schrijver. The strong need for good communications in all aspects & preventing yourself from becoming a bottleneck to the development process was being uttered a lot from my mouth. I’ve talked previously about proactive testing here in my site & the benefits it can provide, however communication is something I’ve yet to write about. I’ll write up how I’ve overcome communication problems soon I promise. There was quite a lot of talk about Gojko Adzic and how inspirational & controversial his recent talk at Agile Testing Days was. It appears to have made a big impact on people. Another Agile Testing Days speaker was Markus Gärtner. His talk “Alternative Paths For Self-Education In Software Testing” & mainly his section on Testing Dojo’s had inspired a lot of people. It had previously inspired myself to try out challenges in my team when I’d watched his Eurostar webinar on this talk. I talked about the challenges we’d undertook in my team, and how beneficial they had been for us in terms or learning & developing our team’s skills. I’d also highlighted how beneficial they could be in getting the team to think on the same level & use techniques that had proved to be very efficient when doing these. Some people talked about setting up similar local gatherings elsewhere in the country. Likewise someone also mentioned creating a learning institute in the style of the AST but with more of a selection of topics to learn from & be graded on. I’ve no idea if any of this will happen, but chats like these might eventually inspire someone else to do them. I talked with a bunch of other people, however I’ve forgotten your names I’m sorry about that, hopefully you’ll see this post and look me up twitter so we can keep in touch. There were also opportunities for those seeking employment. A few recruiters attended & one guy Sharath Byregowda (a founder of weekend testing) got a speech from Michael Bolton calling on any recruiters present to hire him. Michael said he’d recommend him himself. Having done a similar thing with Ben Simo on his blog recently it goes to show the character & integrity of this man, who will happily help out a fellow tester. In fact Bolton spent most of the night slowly working his way around the room, chatting with everyone & making sure he’d spent some time discussing something with each person. He really is a great guy & like his Rapid Software Testing colleague James Bach he’ll happily set aside some of his time for you when needed. So I’ve talked a lot about what happened & what was discussed, but what did I learn? Well I learned that these are excellent events in which to meet and discuss our craft with other fellow members of the trade & certainly if I’m every seeking employment it wouldn’t be a bad idea to attend such a gathering. I left with a new challenge to share with my team which I know for sure will provoke their minds and inspire positive discussion & understanding about our craft. Learning from other people’s experiences, I did a lot of that. Mostly reminding me of how valuable & important good communication skills are. These being something we all know at the back of our minds, but it was really surprising from talking to others how many fall into the trap of neglecting or forgetting about them. Relationships can be fragile; we don’t want to create barriers or obstacles to them. I also learned that people will happily discuss certifications & if they had one or not. However when Michael Bolton was in earshot they’d quickly shut up about it No one had anything good to say about them anyway & Michael did suggest that we simply put in our CV “I am not ISEB certified for a very good reason which I’d be happy to share with you if you’d like to know why.” Those might not be his exact words but it was along those lines. The main benefit for me came from discussing what I do in my workplace & talking about things which I didn’t necessarily agree with. These made me realize that I am doing the right things! As such I shall continue to chase new ideas that spring to mind & learn from my other fellow craftsman. Chats can become reality. Even over a pint of beer! As a final worthwhile note, someone mentioned midweek testing & a lot of people including myself expressed their interest in this. Guess what’s just been announced on twitter today? Thanks for reading, and if you get the chance, I’d highly recommend you attend one of these. Thanks for the excellent write up Darren, I’m glad you had a interesting night. It was great to see the regulars and great to see new faces. I was amazed at the turnout considering the strike. And thanks for capturing the triple chins so nicely! I like the idea of the “Do not disturb” sign on people’s desk. Although I can see this getting abused and people leaving it up all the time! If they don’t already, it’d be great if events like these happened all over the Country. For example, the Midlands, Yorkshire, Lancs etc… I’d consider attending one if it was fairly close. The key to making the “Do Not Disturb” sign thing work is having ground-rules which I stick to rigidly and I make sure everyone knows why I am on “uninterruptable” time. 4. I respect other people’s needs when they are working on something critical for which they do not want to be disturbed. Within our environment this works well but in other work situations this would not necessarily be the case. If I recall correctly, the reason Michael Bolton, Mike Scott, Anders Dinsen and myself were late was down to the eternal search for an O2 store. We pegged it from the hotel to Kensington High Street where we found aforementioned store. Then due to a combination of fuzzy logic (commonly known as ‘The Knowledge’ among London’s taxi drivers) and Mike’s iPhone 4 GPS we further pegged it to [IDon'tKnowWhereTheHeckWeWere] tube station where we rode in style to Liverpool Street, but not before venturing down a few dodgy looking alleyways, once again, thanks to Mike’s absolute trust in Apple/Google/GPS (it was tested well, I’m assuming). Was a top evening, indeed. As testers, we certainly tested the bar staff! You are absolutely right about why we were late. We were testing O2′s service level to non-residents of the UK! I will never forget the HOT tube ride or the fun we had getting around. That alleyway was an interesting side of London I’ve never experienced before! Anyone who can remember any of the truths Michael shared in his presentation? I remember laughing a lot. - When a manager asks you to show him your test cases, ask him to show you his management cases. - I knew a guy who had a documented process for everything. He starved to death when he lost his process document for making breakfast. It IS great, but calm down. Thanks for the mention it was really sweet of you. As you gather from our brief encounter that I have been in the software development space far longer than I care to admit working over all aspects of software development, testing in particular. You captured the London testers gathering purpose and existence for the benefit of testers very well after your first attendance. I give you 10 out of 10 for that. The event is not just about learning testing tips from each other but also about each other to build a stronger community around us to support us when we need. Tony and I started the event jointly but I dropped out after poor attendance. Credit goes to Tony for keeping the group alive.I will still be around if needs my help. Glad due to Michael’s intervention Sharath now got a job. I like Michael because he speaks his mind. Great write-up. I’m glad you enjoyed the evening – shows my recommendation was a good one! I’d try an arrange one, you’ll probably find you get a good turnout. Most people that don’t attend this one, do so because they stay so far away. London after all isn’t really a central location on the map of the UK or even England. I’d no doubt he’d get himself a job, that’s excellent news Also thanks for the kind words. I’m glad you liked my write up, hopefully we’ll meet again soon, sounds like you might be in Scotland from time to time. A good, and accurate write up of an interesting event. Likewise it was a pleasure to meet everyone. Commenting as one of the co-speakers, though not the guy actually driving the StressTester demo, it was good to get so many questions on the night and your scepticism on the the ‘no scripting’ is both understandable and healthy! Id anyone ever claims this you should challenge it. Many tools claim to be so yet they all drop out to scripting or code as soon as the test gets the least bit complex or the simulated transactions (scripts) – we call them User Journeys – require data or response handling to be dynamic, alternate flows etc etc. StressTester however is not like that; it really is 100% script/code less in use. Why not drop me an email to ian.tunnicliffe@reflective.com or maybe even download the software and try it for yourself at http://www.stresstester.com. Let me know what you think. Its learning experience for me. 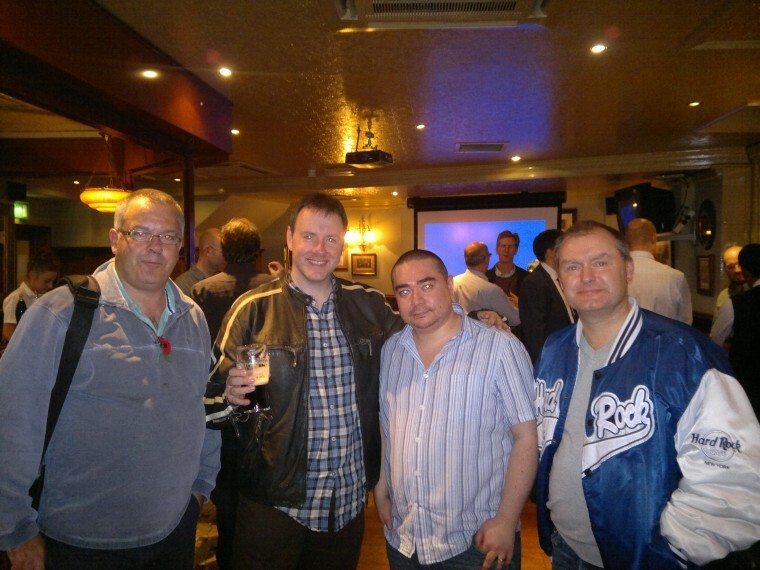 Great event…Thanks all of you & big thanks to Tony for organising event. Hope to see you all soon.